When Chinese New Year rolled around I was anxious for my five-day trip. I flew from Shanghai’s Pudong airport into Guilin, which took three hours. I had been nervous about how to get to Yangshuo from Guilin, but it was much easier than I expected. As I was walking through the airport I saw signs in English that said ‘Bus to Yangshuo’, so I followed them. I bought a ticket and arrived in Yangshuo an hour and a half later. Arriving at the bus terminal in Yangshuo is a big mess because there is very little organization. The ‘bus station’ has places for buses to park with numbers, but then loads of men on motorcycles waiting to take passengers where they need to go next. I gave him an address and reluctantly got on the back of the bike. I was speechless as we zoomed through the small streets toward my hostel. 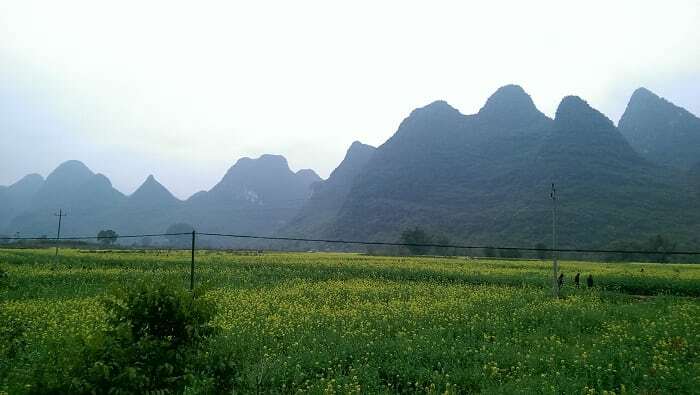 Guangxi province, especially Guilin and Yangshuo, is adorned with peculiar mountains that look as if they just decided to pop out of the ground one day. They are very tall and can be quite slim like cones, so I was in awe as we drove through the small town weaving in and out of the mountains. I was able to arrive at my hostel with minimal problems, appropriately called “Climbers Inn”. I left my things in the room, got a map of the small town, and left to explore. My time in Yangshuo was quite dreamy – I spent every day climbing, was blessed with near perfect weather, and met amazing new friends. Most people who visit Yangshuo do the famous river tour and drift down the river on a traditional boat, or go on a few of the famous hike. 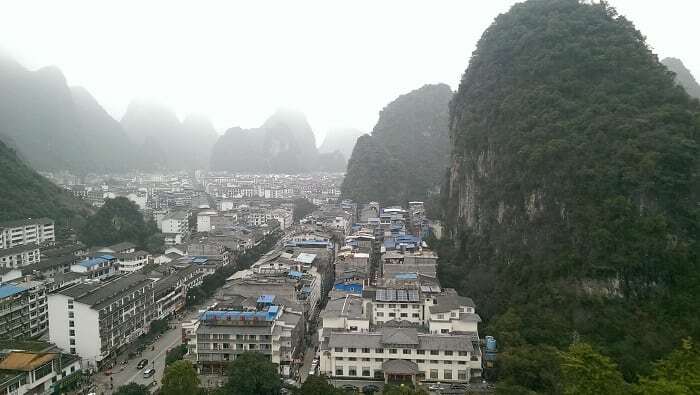 For my stay in Yangshuo, I lived and breathed climbing. It was lucky that I had a friend there. José was studying at an academy called Omeida Chinese Academy. This academy has opportunities for foreigners to learn Mandarin, as well as for the locals to learn English. I was introduced to many of José’s friends who were also studying there and came from Brazil, New Zealand, Lithuania, Australia, the United States, and other provinces in China. We went out to dinner together and agreed on a meeting spot to climb some mountains the next day. The following day I woke up early, had a quick breakfast with a couple of guys at my hostel, and set out with my gear and rental bike to meet the others. I met José and some of his friends from the academy, as well as other who had come to visit from Shanghai. Yangshuo is known as the climbing mecca of China (besides Yunnan), and there are hundreds of crags (rock faces) and routes to choose from. We consulted the book that local climbers had made of the climbing routes and picked one of the more popular crags called “Baby Frog”. The bike ride there was incredible; we rode on a small paved road that led us out of the city through small villages. The road wound through the mountains and between farms and ponds. It was one of the most beautiful places I have ever seen. There are three main types of sport climbing: bouldering, top rope, and lead climbing. Bouldering is climbing on short routes lower than four or five meters and doesn’t require any ropes or equipment. Top rope climbing requires harnesses and other equipment for belaying (the person at the other end of the rope who catches you when you fall), and the rope is already secured through an anchor at the top. In lead climbing, the climber has the rope attached to them first, clips some quick draws into bolts in the rock, and then clips the rope into the quick draws. We were mainly lead and top rope climbing during my trip. Once we arrived at the crag we hiked up to the wall and consulted the book to see which route to tackle first. This was my first time lead climbing, and I was a bit scared, to tell the truth. My friends walked me through the steps and I hesitantly did it. The thing about lead climbing is that since you are clipping in as you go if you miss one you will have a big fall. I played it safe and did an easy climb to get used to it, and was grateful for the others’ guidance. We spent the day climbing, belaying, snacking, and gazing at Yangshuo’s mountains. In a country of 1.4 billion people, it felt lucky to be in a small village with almost no one around. I quickly got to know the others and learned more about the area. After a few hours, we packed up our gear and headed back into town for dinner. We ate at a small restaurant with tables on the street, who would stir fry up any vegetables and meat you wanted for about $2 USD. Not a bad deal. Each following day went the same: Wake up at 7:30, breakfast, meet the others, bike, climb all day, bike back, dinner, sleep. All of the crags have hilarious names: Baby Frog Buttress, The Egg, Swiss Cheese, Jeremy’s Jiji, Chicken Cave, and so many others. 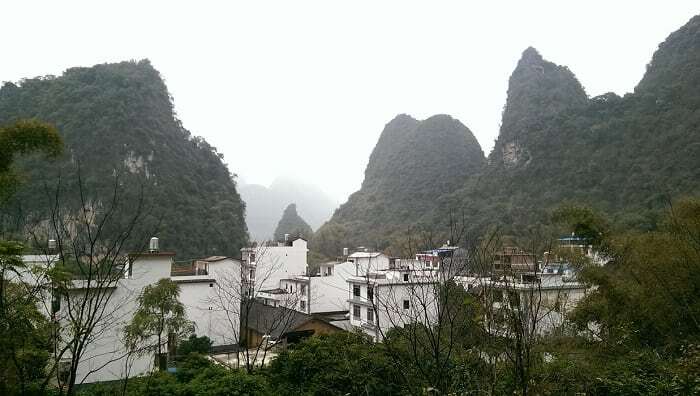 I didn’t feel like a tourist because I was becoming intimately acquainted with Yangshuo’s mountains by climbing all over them, and in some cases, leaving a little blood behind. I quickly made new friendships with José’s friends as we belayed and caught each other’s falls. Yangshuo was a turning point in my experience in China. What was meant to be a visit to see a friend turned into so much more. On one memorable route, I was shimmying up a rock race of 30 meters. We had to hike up quite a bit to the start, so at the top of the route, I was about 50 meters above the ground below. As I looked out across the land and mountains I felt a peace that I hadn’t felt in months. In climbing, you are the only person holding yourself back, and you control your own success. You have to be creative with finding holds and executing moves on the wall, and you’re very likely to fall once or twice. Climbing there was a perfect metaphor for my experience in China; when I first arrived in Shanghai I struggled to understand the culture and just about everything. China is an exceptionally tough place to live if you don’t speak Mandarin and aren’t well versed in cultural norms. My experience in Yangshuo showed me that I could find my people anywhere I live. As my friend lowered me to the ground and congratulated me, I felt proud of myself for completing the route, but also for opening my heart to the new experiences. I returned to Shanghai as a stronger climber and a determination to adapt. 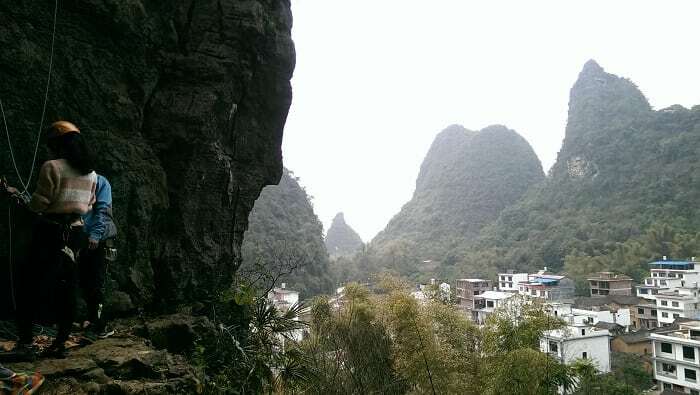 If you want more information about climbing in Yangshuo, you can check out the routes on the Mountain Project.